On March 27, Legislator Anker honored SWRHS student Jordan McClintock at the Suffolk VFW Council Voice of Democracy Award Ceremony. Legislator Sarah Anker honored Shoreham-Wading River High School student Jordan McClintock. Brookhaven, NY - April 11, 2018 - On Tuesday, March 27th, 2018, Legislator Sarah Anker was joined by Brookhaven Town Councilwoman Jane Bonner, Suffolk County VFW Post 2913 Senior Vice Commander Dave Rogers, and Suffolk County VFW Commander Sabrina Lacy to honor Shoreham-Wading River High School student Jordan McClintock at the Suffolk County VFW Council Voice of Democracy Award Ceremony. Jordan earned 1st place in the County and 2nd in the District for her submission to the Voice of Democracy contest, an annual nationwide scholarship program sponsored by the Veterans of Foreign Wars (VFW). The contest provides more than $2.3 million in scholarships annually for high school students in grades 9-12. Students submit an audio-essay on a theme decided by the VFW. The 2017-2018 theme was "American History: Our Hope for the Future". 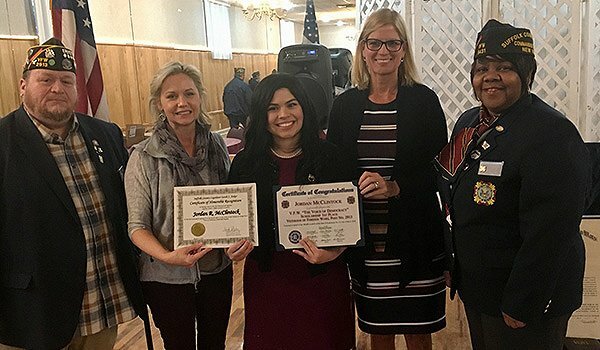 "Jordan sets an inredbe example for her peers, and I am inspired by her patriotic essay that exemplifies her dedication to her country," said Legislator Sarah Anker. For more information on th Voices of Democracy scholarship program, please visit the VFW's website at vfw.org. Suffolk Theater Owners, Bob & Dianne Castaldi to Receive NYS Preservation Award for The Suffolk Theater! Subject: LongIsland.com - Your Name sent you Article details of "Legislator Anker Honors VFW Council Voice of Democracy Award Winner"